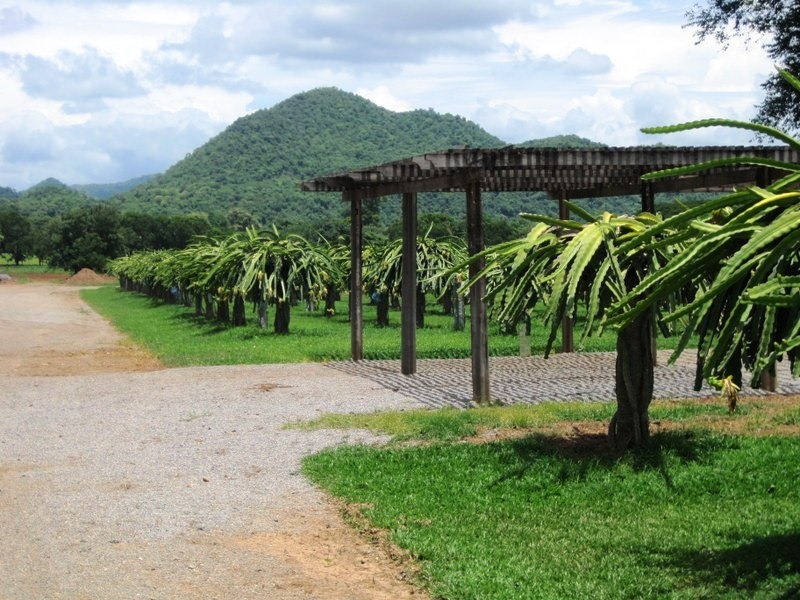 This is the second of three articles about the Khao Yai area in Nakhon Ratchasima, a province in northeast Thailand. 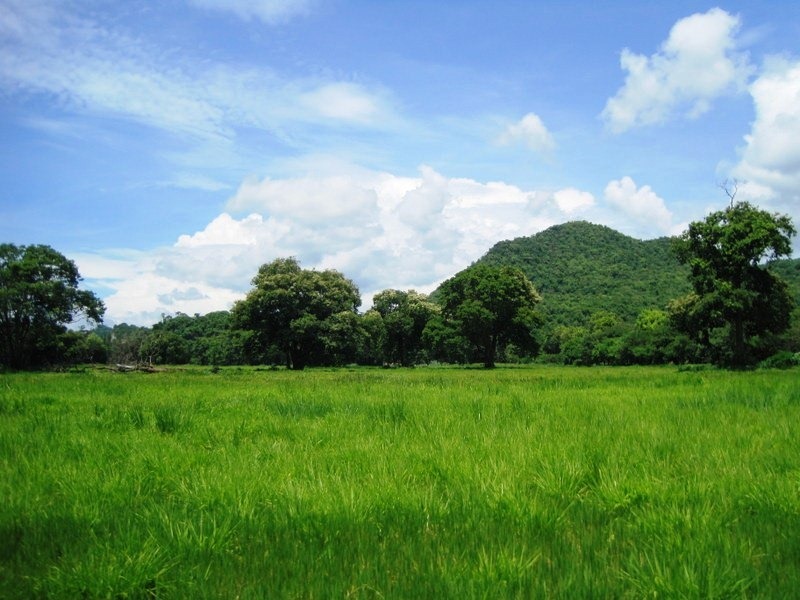 The first article focused on Palio Khao Yai, an Italian-themed village, and the next will feature Khao Yai National Park. 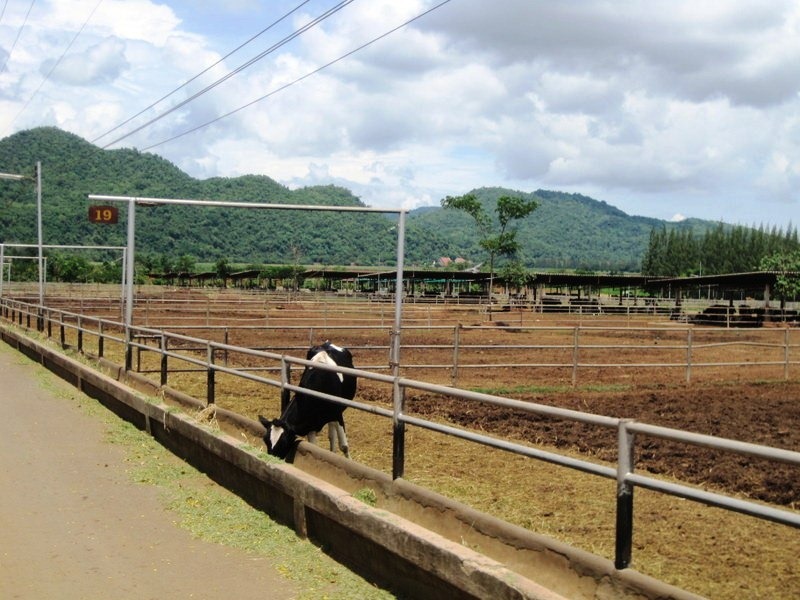 This post is about Farm Chokchai, home to Thailand’s largest dairy ranch. 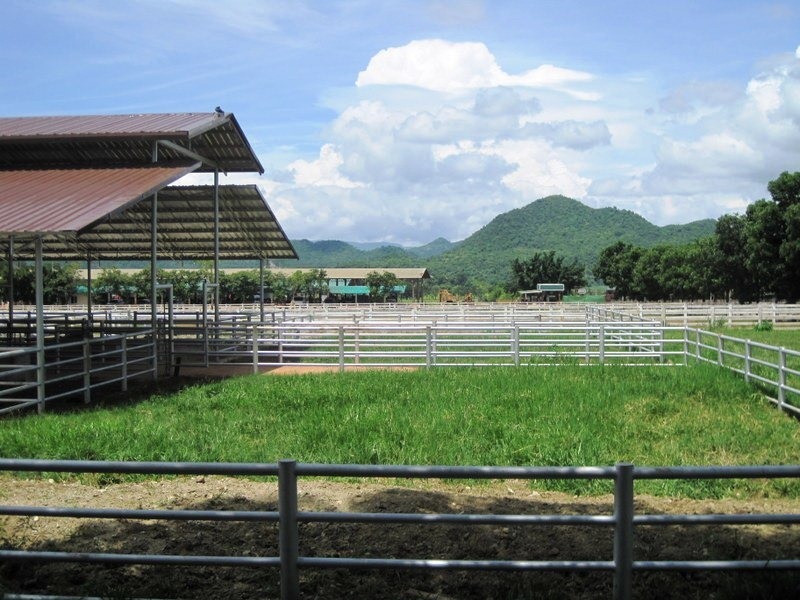 With more than 5,000 head of cattle ranging over 8,000 acres, Farm Chokchai is Thailand’s largest dairy farm and one of the largest in Asia. 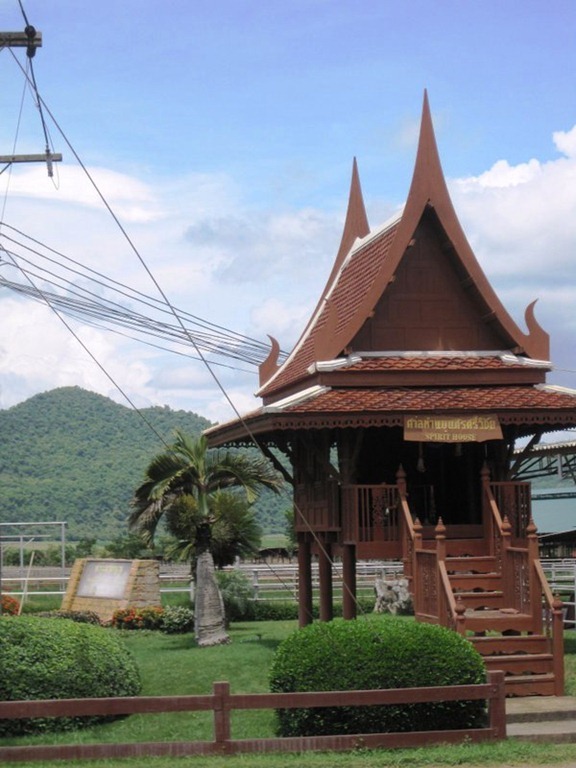 Established in 1957 by Thai cowboy Khun Chokchai Bulakul on 100 acres, the farm has grown during its 55 year history. 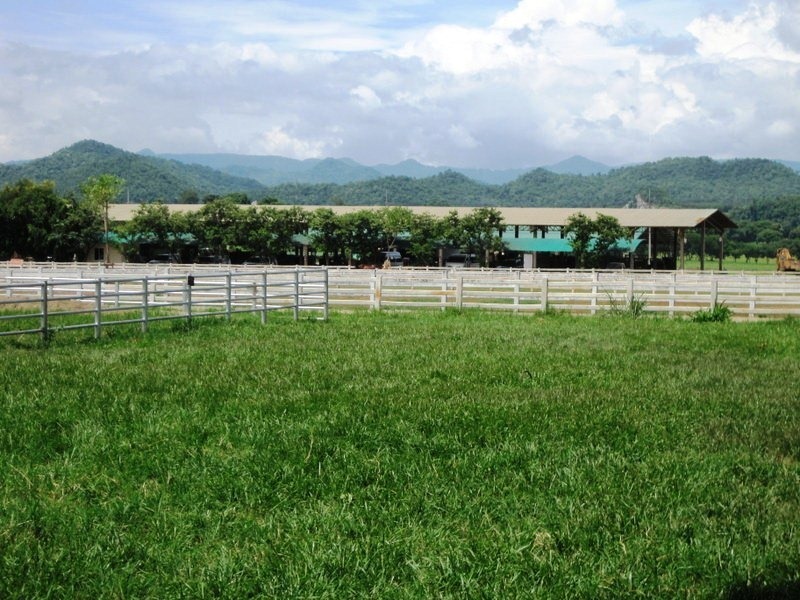 It has had a colorful history experimenting with different businesses ranging from selling machinery and construction materials, raising beef cattle and exporting beef, operating steakhouses, and selling dairy products. Its current iteration is as a dairy farm. 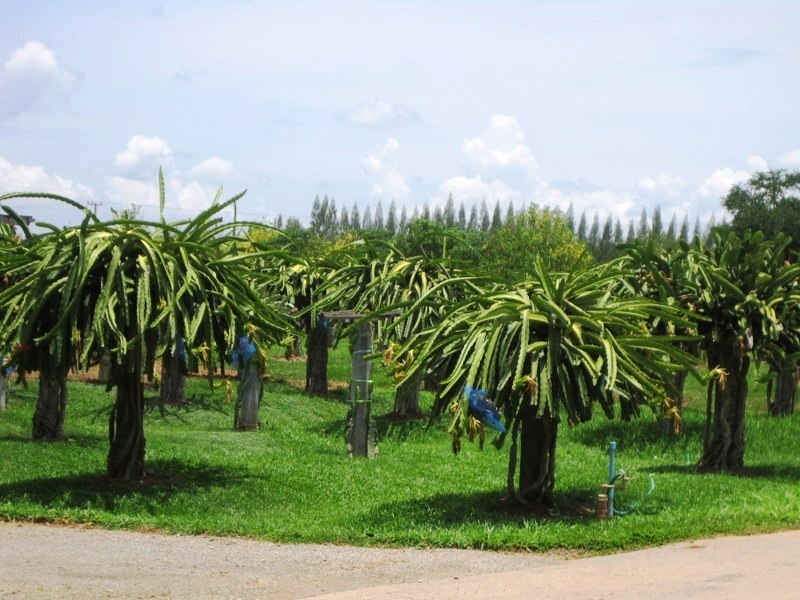 Farm Chokchai went through some setbacks during the mid-1990s Asian financial crisis but bounced back in the next decade. 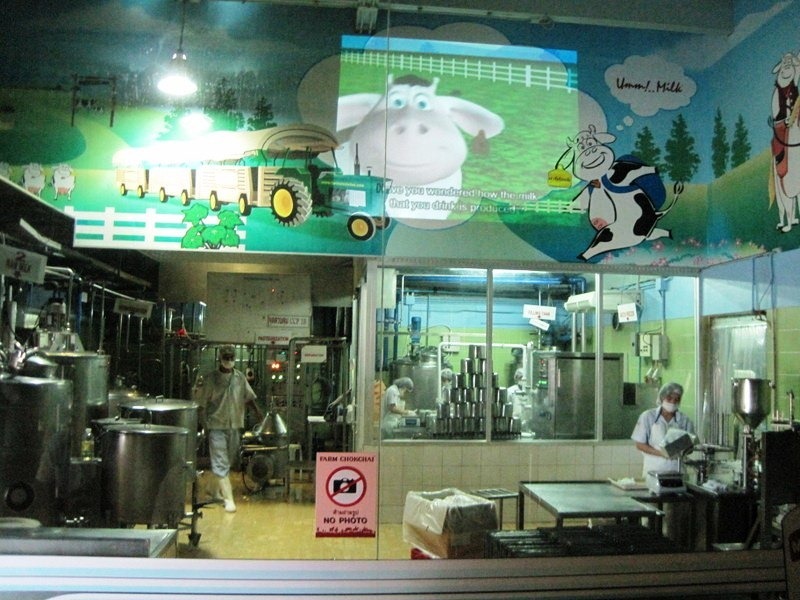 It is now one of Thailand’s major dairy brands with a variety of milk products, including its Umm…Milk line. 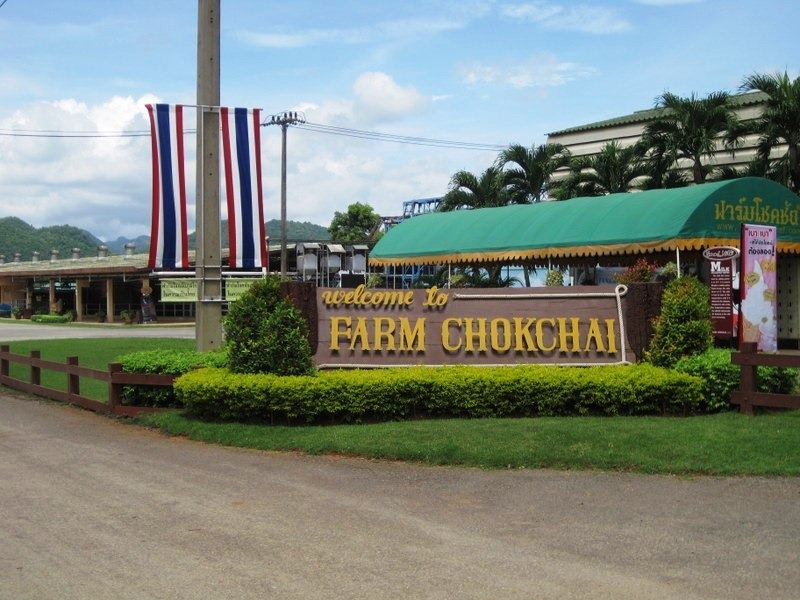 Farm Chokchai is a tourist attraction for those who want to see how a dairy farm and ranch operates. 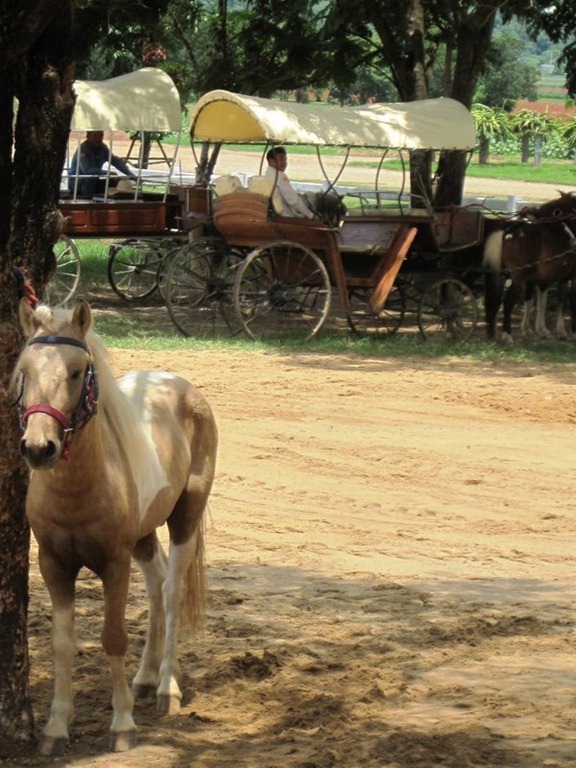 A two-hour drive from Bangkok, it gives those who have limited knowledge of western-style farms the opportunity to get away from the city and “experience” a farm with a “Wild West” flavor emphasized by its owners, the Farm Chokchai Group. 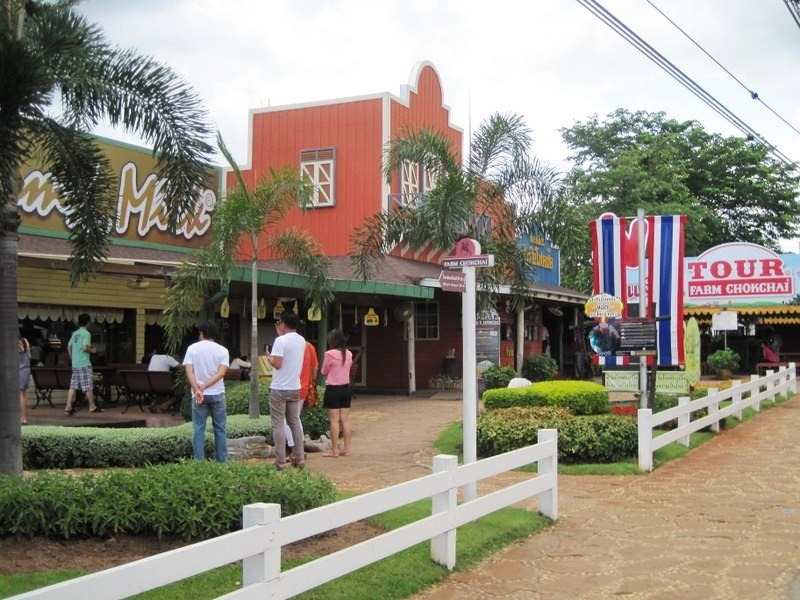 The wood false-front stores reminiscent of the American West, souvenir shops with assortments of dairy products and plush farm animal toys, and carnival games give the place a theme park atmosphere. 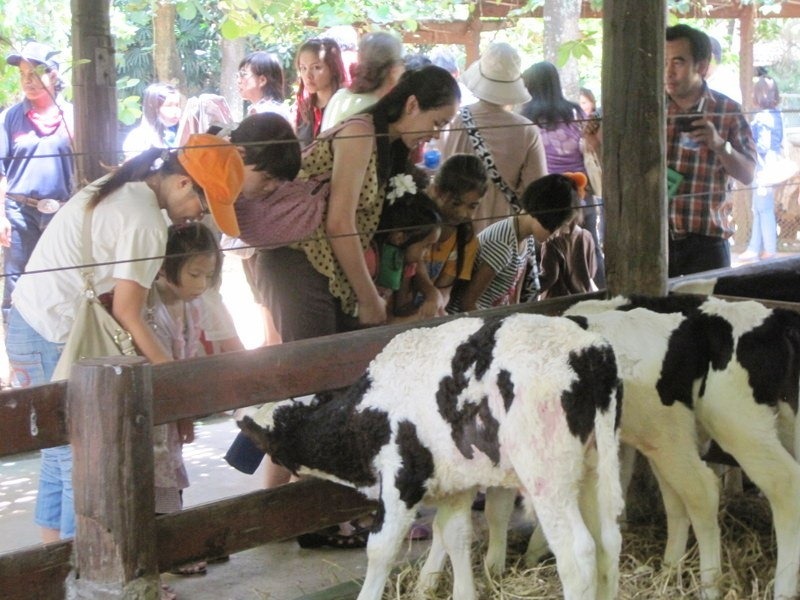 The farm offers a daily tour geared to children as well as “Farm Chokchai Camp,” a facility where visitors can stay overnight and enjoy the countryside. It seems to tap into the same nostalgia for rural life as the online game app FarmVille. 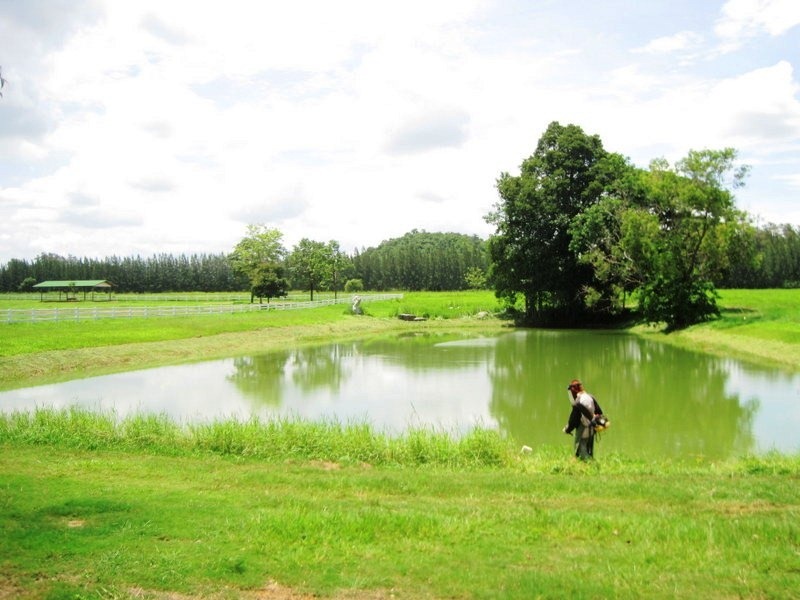 My son and I toured Farm Chokchai in May 2012. 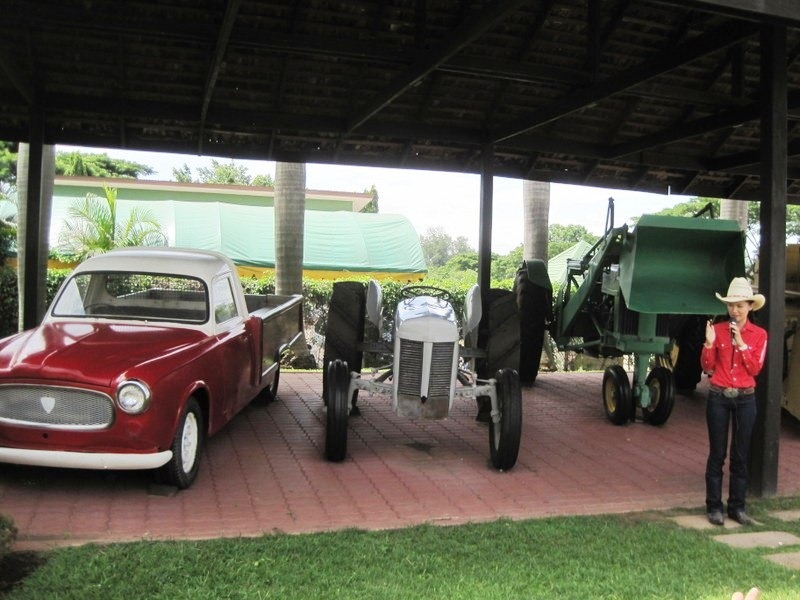 We watched a movie about the farm’s history, then joined a Thai-speaking guide who showed us equipment once used around the farm, including a John Deere tractor that is reportedly one of just two still in existence — the other sits in the company’s headquarters in Moline, Illinois. We then entered a showroom where the farm processes some of its milk products such as yogurt and ice cream. Conspicuously absent was cheese, a food that few Thais eat. The showroom demonstrated how the farm turns milk into dairy products but did not operate as a full-fledge processing plant. 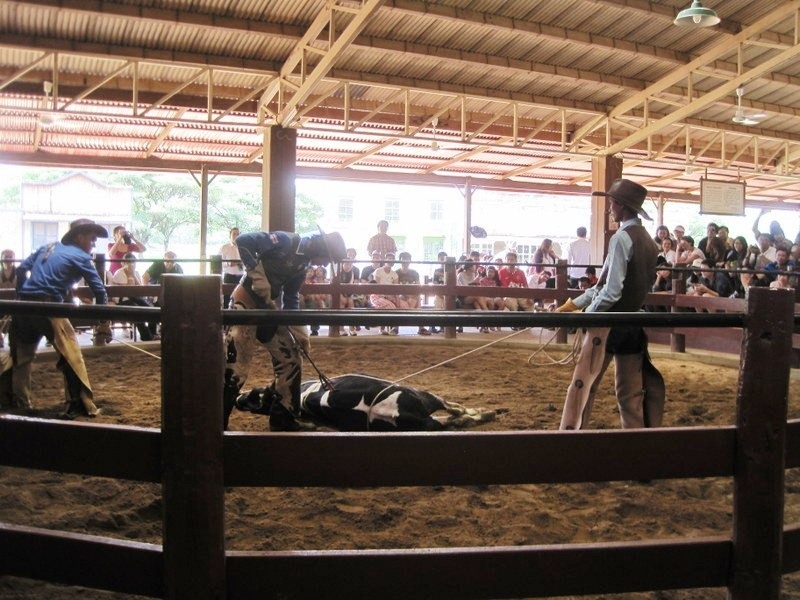 We proceeded to another building where a man demonstrated how bulls are “milked” for sperm to sell to other farms. I was glad that he didn’t show the group of kids on the tour how it’s used! After our biology lesson, we tooled around the farm in a wagon pulled by a tractor. 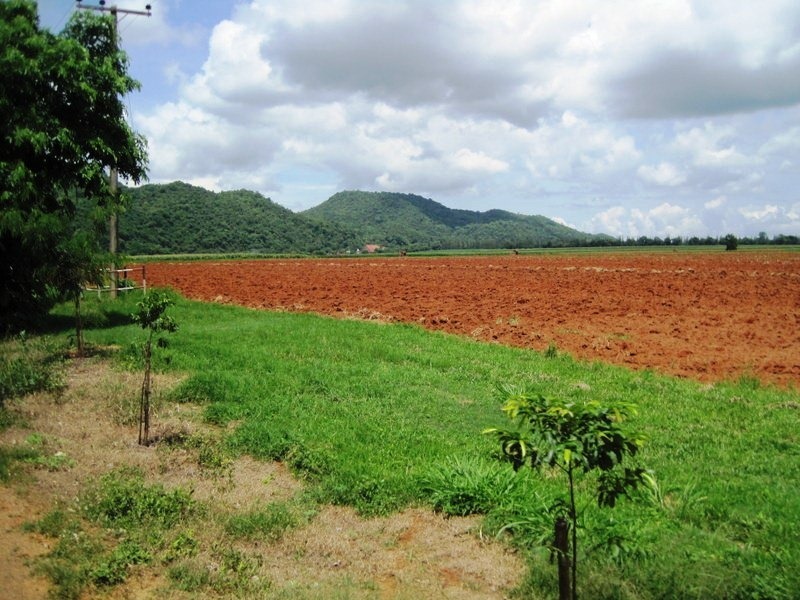 I enjoyed the beautiful views of the Thai countryside surrounding the dairy farm. 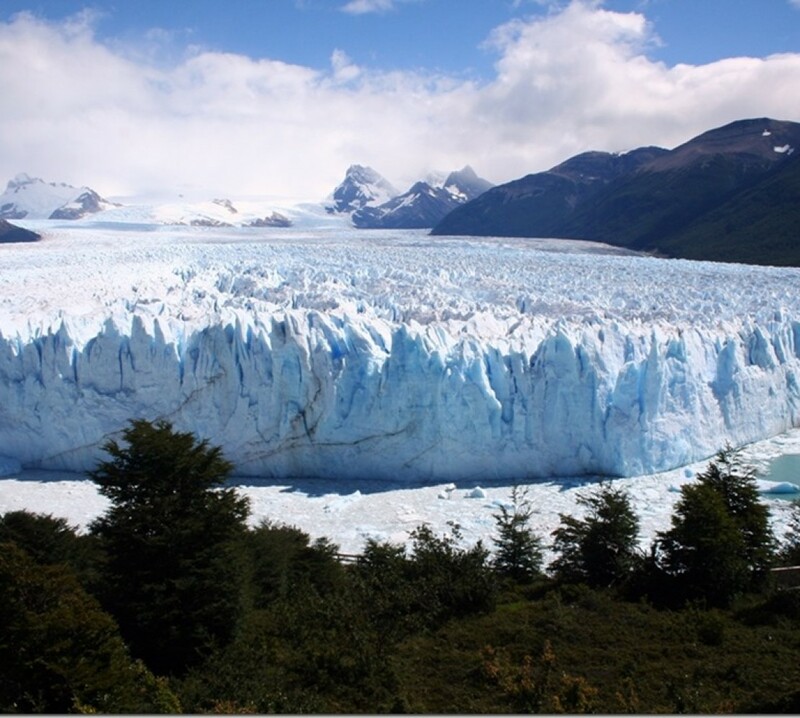 The scenery reminded me of places I’ve seen in the United States, especially Northern California and the Mid-Atlantic coastal region. 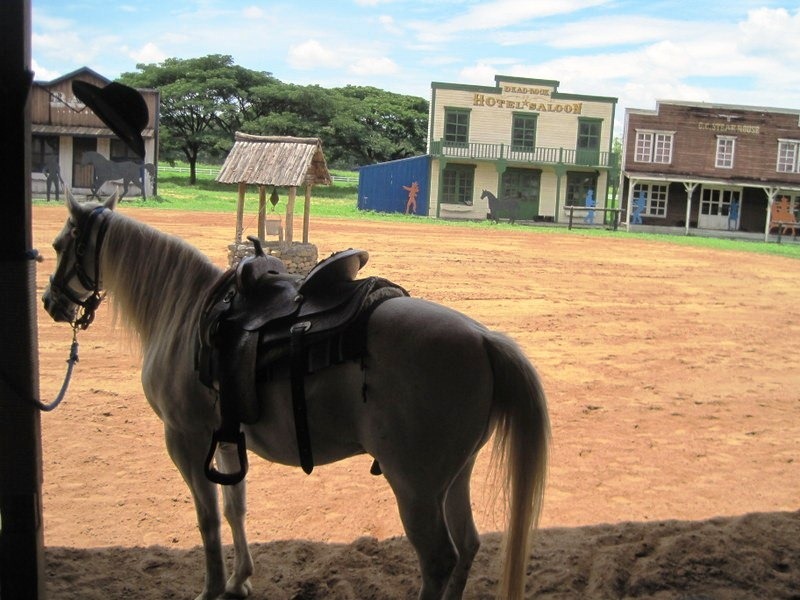 We stopped at a corral surrounded by a ring of frontier-style buildings to watch Thai cowboys demonstrate skills once needed to survive in the Wild West. 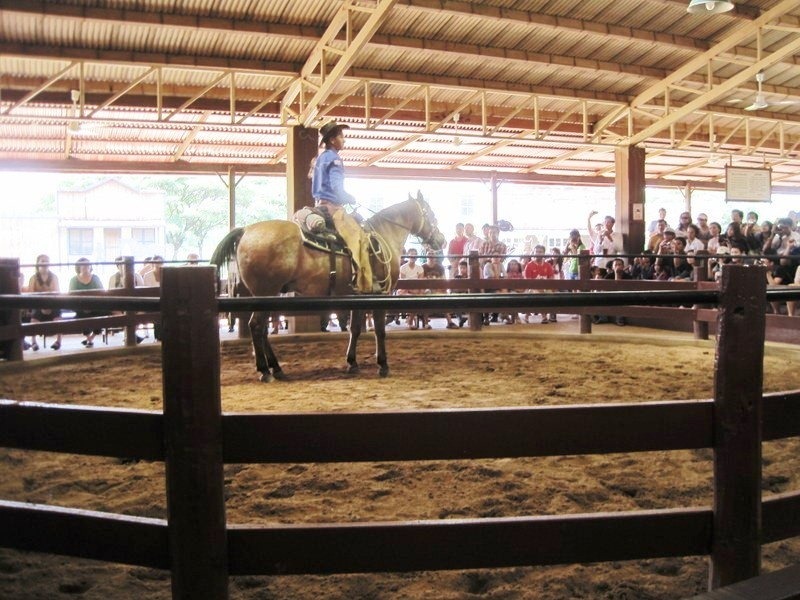 The crowd watched in awe as a cowboy astride a horse rounded up a calf and took it down with a lasso. A woman showed the audience how to twirl two pistols simultaneously, and a man showed off some fancy rope work by twirling his lasso in the air. For many spectators, this would be the closest they would get to a seeing a rodeo. 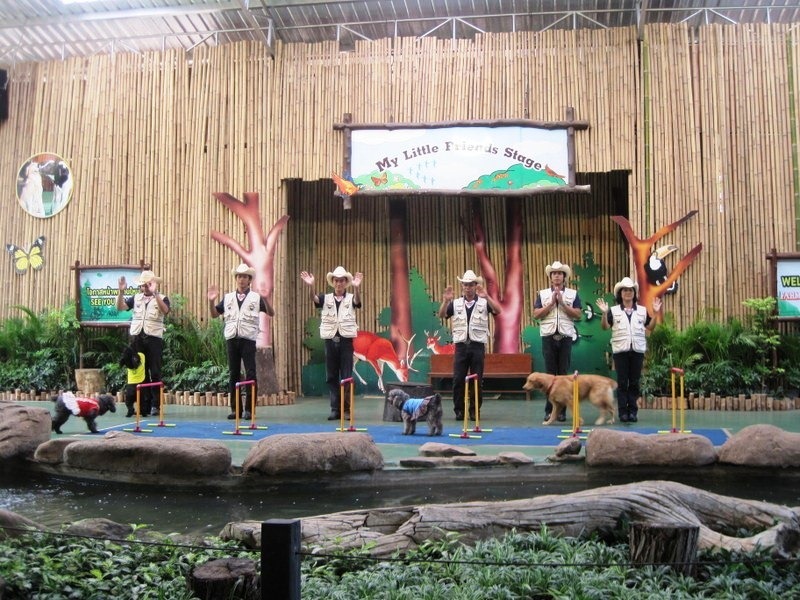 The wagon brought us to an area with a stage where animals wowed the crowd with their talents. 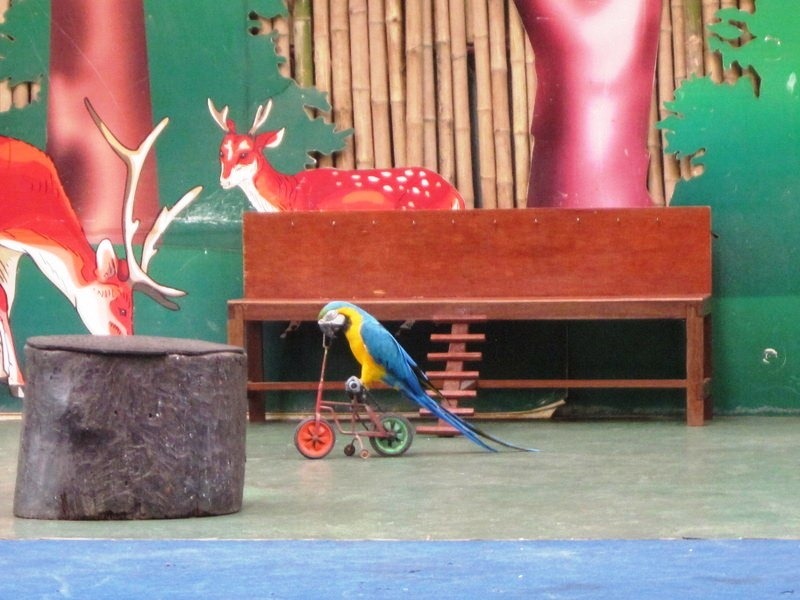 A macaw rode a miniature bicycle; another solved math problems. A goat rode a barrel. 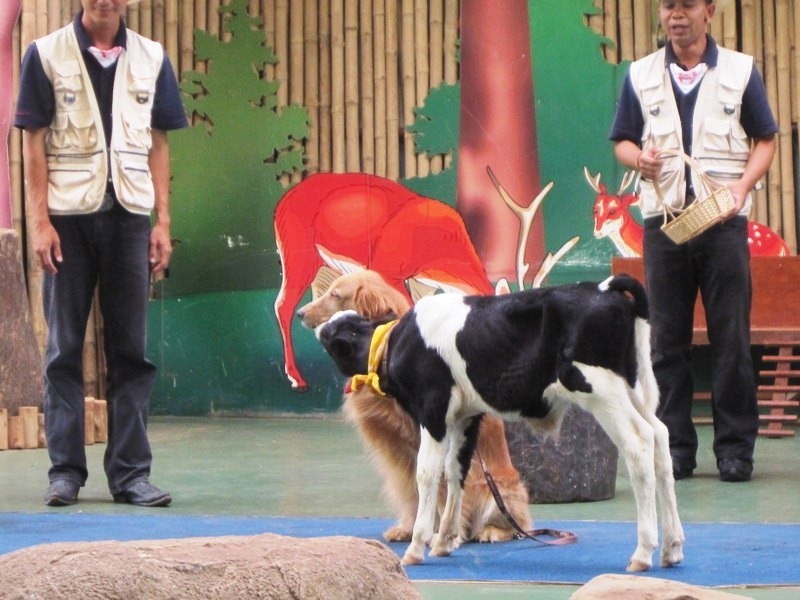 A dog bottle fed a calf while other dogs (literally) jumped through hoops. 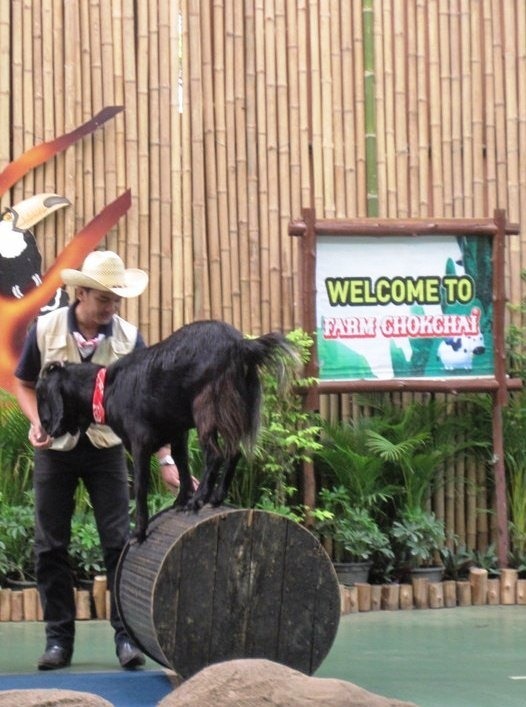 PETA wouldn’t have approved, but then again, Farm Chokchai is a large-scale commercial enterprise that puts animals to use in many other ways. We finished our tour at a petting zoo where visitors, children and parents alike, fed the cows, goats, and Eld’s deer fawns. 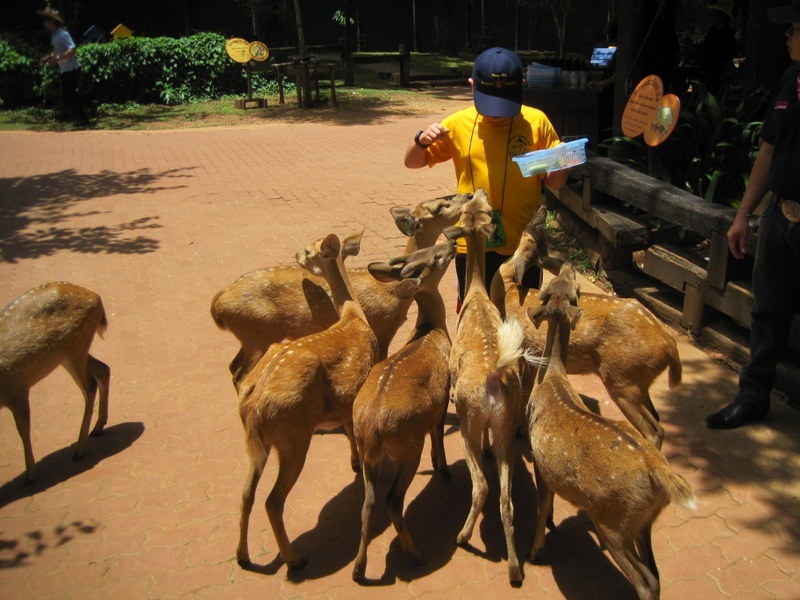 My son enjoyed feeding the fawns. I almost had to rescue him from the herd as they pressed in on him eager for food. Like the nearby Italian-themed Palio Khao Yai, Farm Chokchai is a place in Thailand with an atmosphere that can make you forget you’re there. The farm did a good job of presenting the Old West and western-style farming to local audiences in an entertaining package that’s attractive to kids. 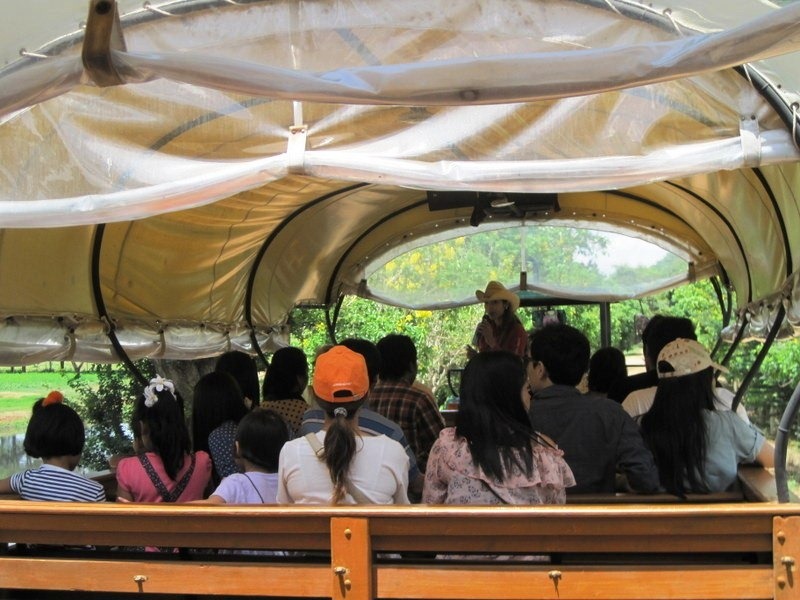 I don’t recommend the tour as a daytrip for tourists visiting Thailand for the first time, but if you’re planning to stay a while, it might be a good diversion from the hustle and bustle of urban Bangkok. Even in Farm Chokchai, you won’t be able to get away completely from reminders you’re in Asia. 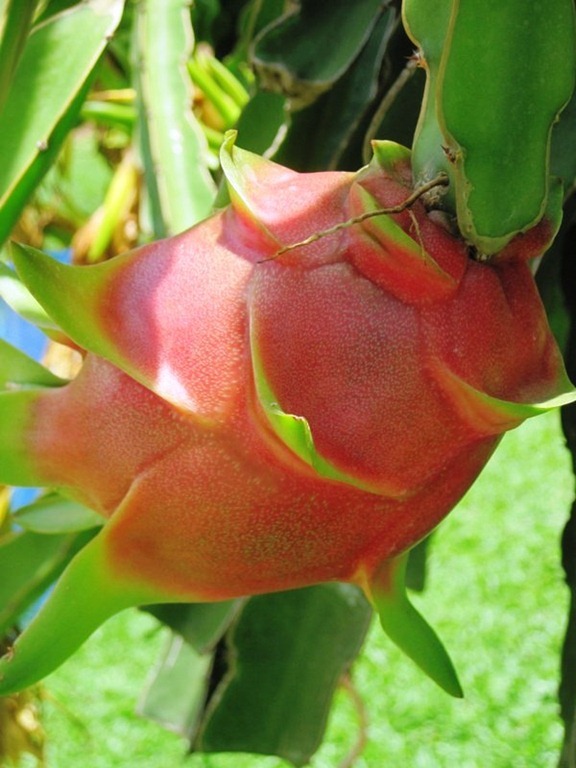 You’ll still see dragon fruit (pitaya) trees and spirit houses that give a distinctly Thai flavor. Wow, I can’t believe they have something like this in Thailand! 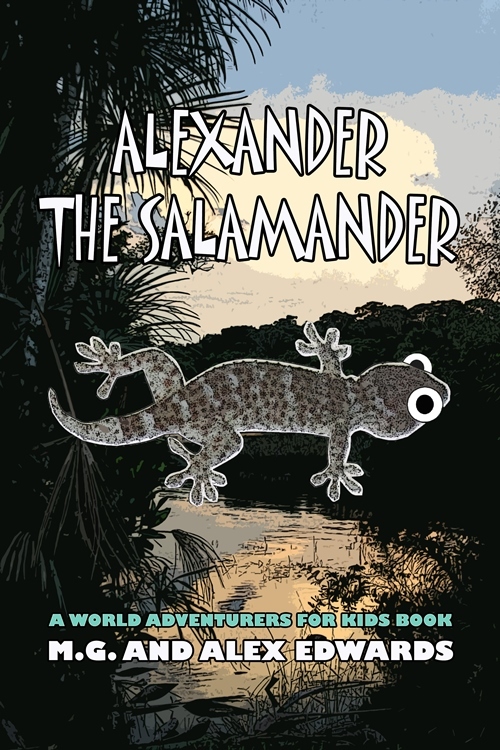 This is very cool and informative. Thanks for a great journey! Although, I still prefer authentic Thailand. Hope they don’t get too westernized as they develop. Mike..I am Imagining Something parallaly..I will share it with my co-partners of my village..Lot of potential here but no funds though educated,still poverty. 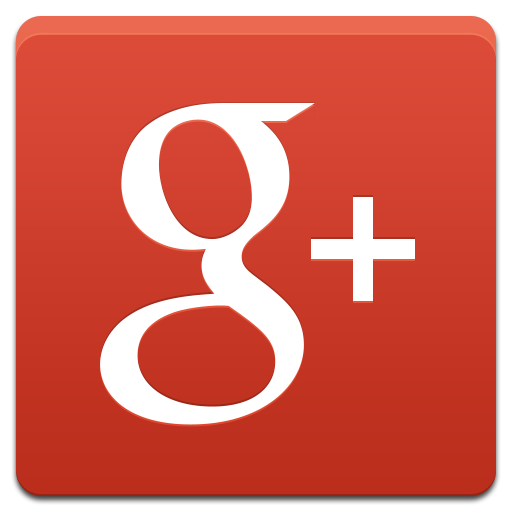 I have shared some of my views two days before with you. 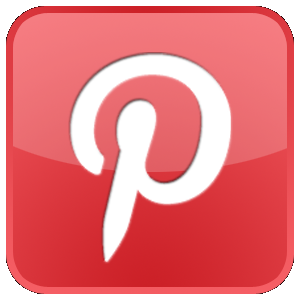 Thank you for this post, this post could give me and friends a way..Let you know the progress on course..Regards to you.. Respect you, for you not being self centered. All villagers knows you and waiting for your visit to Assam. Really, everyone in your village knows who I am? I’m flattered. Looking forward to getting to know them too. Of all the fascinating information and pictures you’ve presented here I got hung up on the “they don’t eat cheese” thing… I cannot imagine not eating cheese. Is there some enlightenment you can offer as to why they don’t eat/like cheese???? 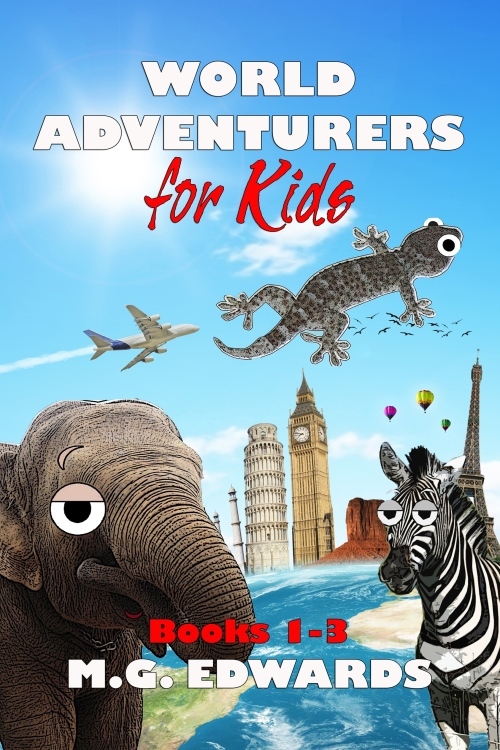 Outside of this need to know, I can’t tell you how amazing I found this to be and so glad you shared it!! Ha ha, well, most Asians don’t use cheese to cook Asian food (Chinese, Japanese, Korean, Thai…) but just yesterday I was shopping at a local grocery store and passed the cheese section. 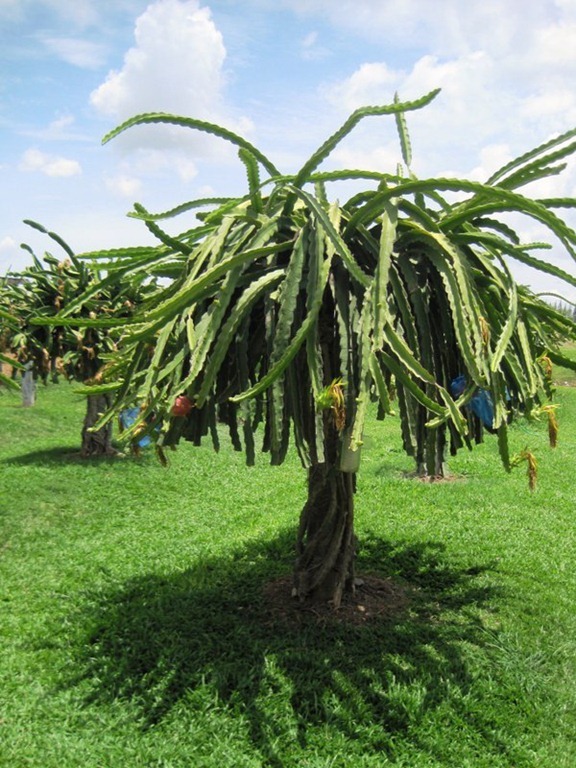 Most of it — maybe all — is imported, and it’s used in foreign dishes like pizza and other Italian dishes. Many Asians like it when they eat foreign food, but not enough to make it worthwhile for companies like Chokchai to make and sell it locally. So we pay an arm and a leg for the imported stuff. You’re welcome! 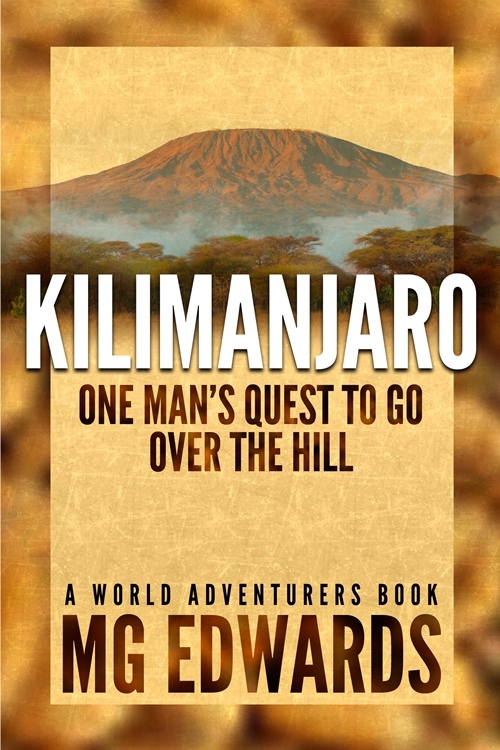 I’m working through thousands of travel photos and plan to post short series from country to country. 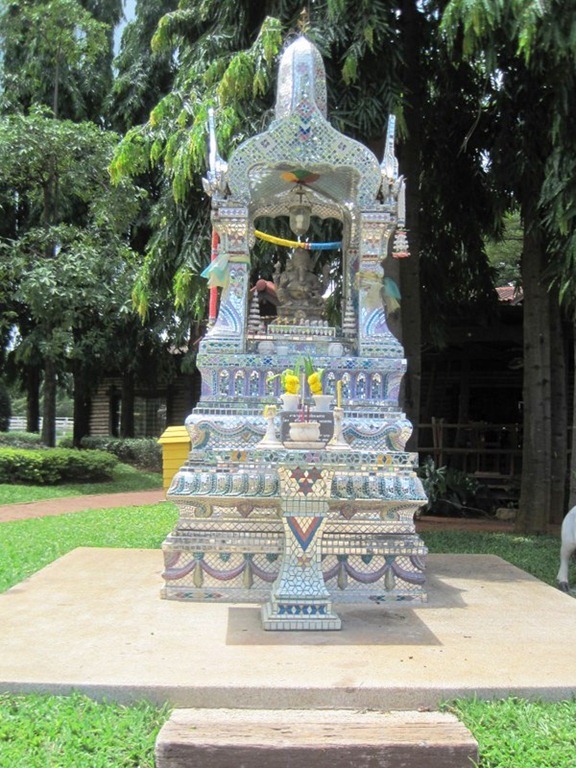 One more post on Thailand, and then off to Korea. Pingback: Farm Chokchai, Camping, Adventure Tour, Milking Factory Family Outing ฟาร์มโชคชัย – - Places.Faces.Fun.